An artist's depiction of SpaceDev's Trailblazer satellite in orbit. The satellite is set to launch aboard SpaceX's third Falcon 1 rocket in late June 2008. BOSTON -The Pentagon announced May 29 that its Operationally Responsive Space (ORS)program office has selected a SpaceDev-built spacecraft over two othercandidate payloads for the upcoming launch of Space Exploration Technologies'Falcon 1 rocket. TheTrailblazer satellite will help pave the way for future spacecraft platformsfor ORS missions using modular designs and off-the-shelf components, accordingto a Pentagon news release. 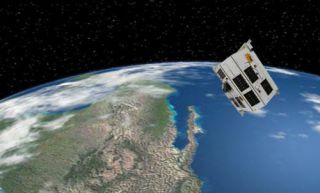 Thesatellite was developed as part of the U.S. Missile Defense Agency'sDistributed Sensing Experiment, which was intended to examine the use ofinexpensive small satellites for spotting and trackingballistic missiles. That experiment was canceled last year. Trailblazerwill launchin late June aboard a Falcon 1 launched from Kwajalein Atoll in theMarshall Islands. The Falcon-1 has failed to place a payload in its only twolaunches to date. In aneffort to demonstrate the flexibility and responsiveness that are central tothe ORS concept, the ORS program office considered three payloads for theupcoming launch, the idea being to make a selection much closer to the liftoffdate than typically is the case. The two other payloads considered were: TheU.S. Air Force Research Laboratory's Plug and Play satellite platform, whichwas the first choice, but trailed the others in terms of readiness; and CUSat,which was developed under a partnership between the Air Force and CornellUniversity and consists of two tiny satellites that would separate in space,with one taking images of the other and sending them to the ground todemonstrate an orbital inspection capability. PeterWegner, director of the ORS program office, said in the news release that theoffice remains interested in "seeing all three of these spacecraft successfullycomplete their missions, and will work with the broader community to make thatdesire a reality."